You will want to be sure to visit St. Simons Island if you ever find yourself in coastal Georgia. St. Simons real estate is in great demand thanks to its scenic and historic location. While the island is most well known for its natural beauty, it boasts a number of historic attractions as well. We have put together a list of three of the most interesting for you to visit when you need a break from the St. Simons surf. On July 7, 1742, during the War of Jenkins’ Ear, Spanish troops invaded Georgia at this location. The British ultimately achieved victory and defended the territory, providing a much-needed boost to morale. In fact, this victory proved to be a decisive turning point in the war, as the Spanish ultimately found their attempts to overtake British territory in coastal Georgia defeated. Today there is a plaque at the site marking this important moment in Georgia’s early history. Christ Church is one of the oldest churches in Georgia and was officially founded in 1808, although its history can be traced back as far as 1736. The church suffered a severe blow when Union troops destroyed it in 1862 during the Civil War, but devoted members rebuilt it on its original cornerstone in 1884. The building today boasts gothic-style architecture and beautiful stained glass windows. St. Simons Lighthouse and Museum allows visitors to explore the history of one of the area’s oldest structures in continuous use. Like Christ Church, the current structure is a rebuilt version of the original, which was destroyed during the Civil War. The current lighthouse, which is still in use, was constructed in 1872 and included a beautiful Victorian-style lighthouse keeper’s residence. This residence became outmoded in the mid-twentieth century, when the functioning of the lighthouse was automated. 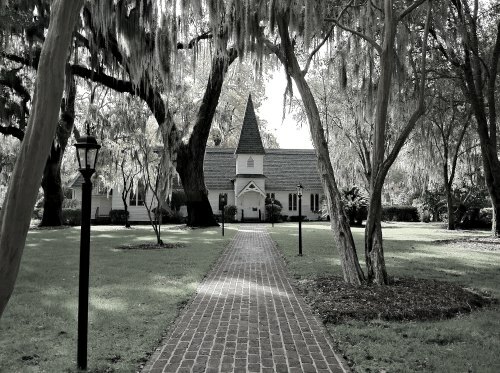 All in all, St. Simons Island offers no lack of historical sites to explore in addition to the fascinating homes and beautiful scenery that make it such a unique and attractive destination. To learn more about St. Simons real estate, please contact DeLoach Sotheby’s International Realty.